The corn is so delicious right now that I had to make this soup. 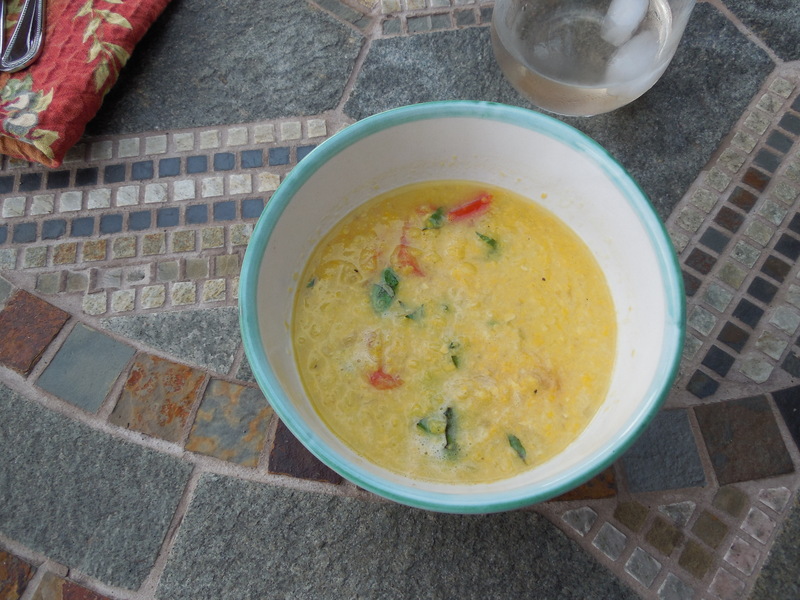 I was going to save this recipe for the Fall but I used the fresh Olathe corn at the market now and couldn’t wait to share. When the corn is not as fresh and sweet you can definitely use frozen . I used fresh tomatoes from the farmers market and fresh Olathe corn ( local in Colorado) but I happen to know Long Island has particularly good sweet local corn. So while the getting is good and you can get fresh vegetables please do so. Farm to Table here we go again. I made this soup for dinner as an appetizer. I think it would be good cold but I prefer it warm. In a large dutch oven ( Le Creuset) type of pot, heat the olive oil over medium-high heat. Add the shallots, salt and pepper, cook stirring occasionally until shallots are soft, app. 5 minutes. While this is going on cook up the corn as follows. Bring a pot of salted water to a boil and just cook corn till it turns yellow for 1-2 minutes, then I throw into an ice bath to stop the cooking. When corn is cooled down cut kernels off cobs. Place the cooked shallots, corn and chicken stock into the blender. Pour the corn mixture back into the pot. 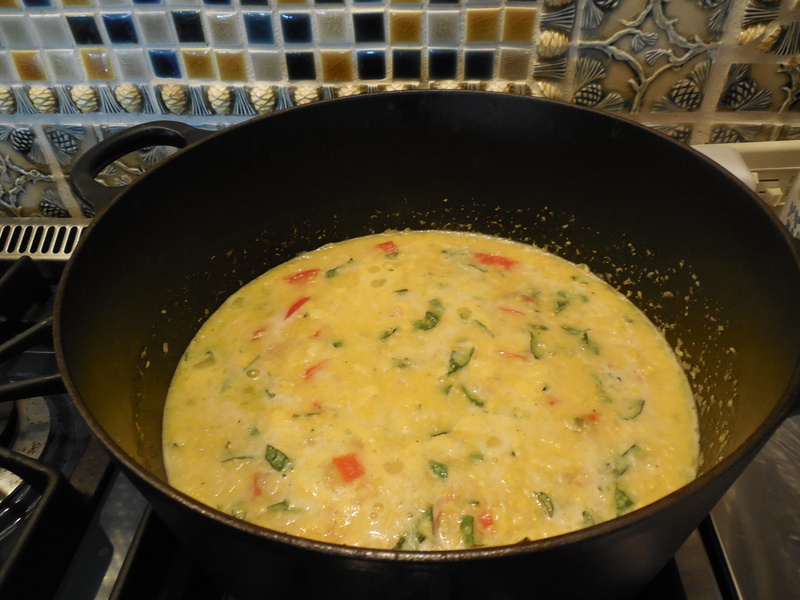 Bring the mixture to a low simmer , cook for about 15 minutes, stirring occasionally, just to heat through. Remove the pan from the heat and stir in the tomatoes and basil, let it cook for another 10 minutes or so. Taste for Salt and Pepper. Ladle into soup bowls and serve! *to seed the tomatoes, cut them in 1/2 horizontally and using a small dessert spoon, scoop out the seed and discard. The seeds make the soup too watery. 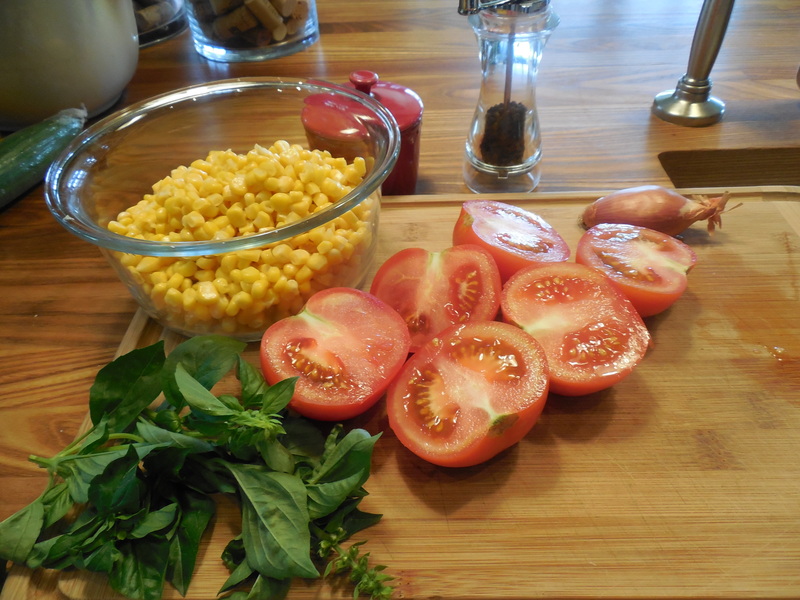 This entry was posted in Healthy Cooking with Candi, soup, Uncategorized, vegan, vegetables, vegetarian and tagged Corn Soup with Tomatoes no cream, Creamless Corn Soup with Tomatoes. Bookmark the permalink.